Learn to add HTML tables to web pages. Learn to break up tables into head, body, and foot sections. Learn to merge table cells. Tables are made up of one or more table rows, which contain one or more table cells. The tag for creating tables is <table>. The table row tag is <tr> and the two tags that can create table cells are <td> and <th>. Below is a simple table. The <th> elements are table header cells. By default, their content will be centered and bolded. The <td> elements are table data cells. By default, their content will be plain text and left aligned. 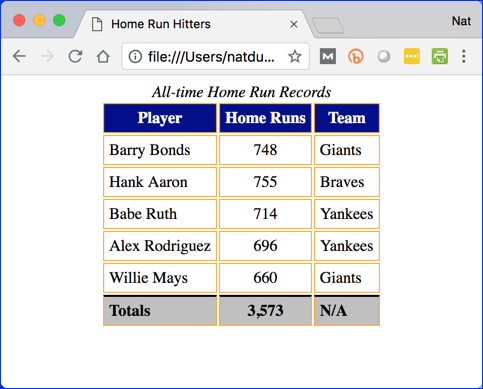 The display of tables (background colors, borders, column width, row height, etc.) can be controlled with CSS. 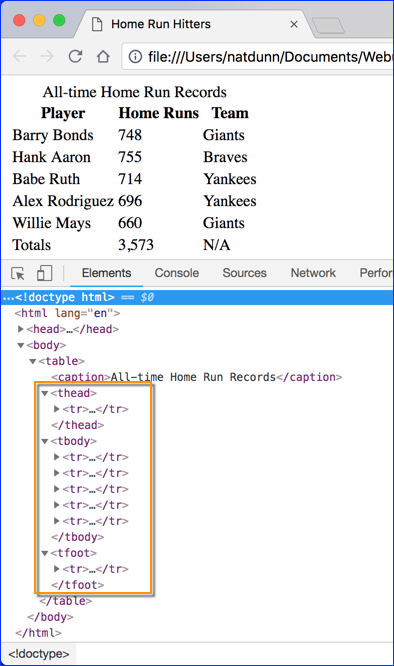 Table rows (<tr> elements) can be divided into <thead>, <tbody>, and <tfoot> elements. If these elements are left off, it is assumed that all table rows are part of the tbody. We can illustrate this with Google Chrome (other browsers also have this feature). 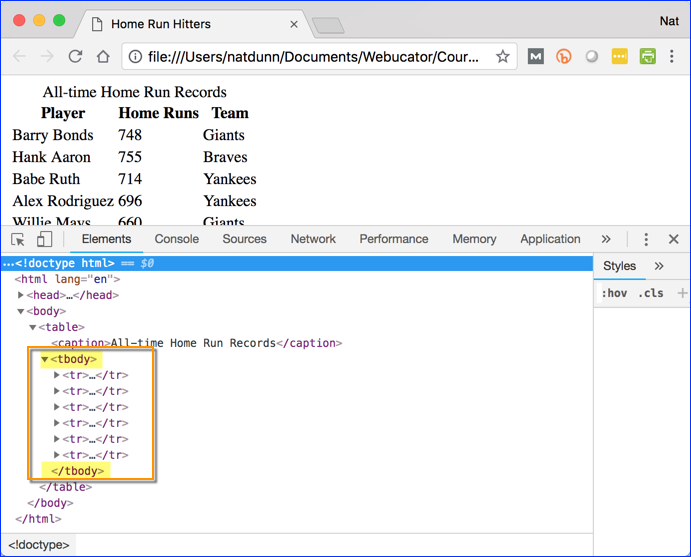 Open Tables/Demos/table-homeruns.html in Google Chrome. 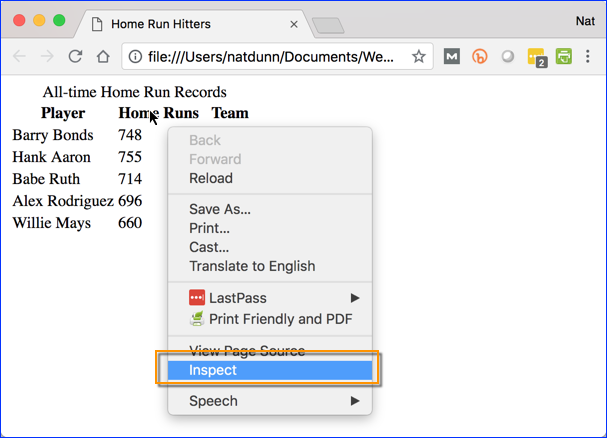 Right-click anywhere on the page and select Inspect. This will open Google Chrome's Developer Tools on the Elements tab. You may need to click on the tags to open them. From the above screenshot, you see that Google Chrome considers this table to have a tbody element even though there are no <tbody> tags in the code. As you can see, we have broken up the rows into a thead section and tbody section. We have also added a new table row in a tfoot element. We aren't ready to cover CSS yet, but this should help you understand why it is useful to be able to identify the different sections. Note that the second table row has only two cells; however, it spans all three columns. In HTML, this is accomplished by adding a colspan attribute to any table cell that spans more than one column. The following code would create a table like the one above. Note that the second table column has only one cell; however, it spans both rows. This is accomplished with the rowspan attribute as shown in the code below. In this exercise, you will create a table from scratch. Open Tables/Exercises/resources.html for editing. Note that we have added some CSS in the head to style the caption and put a border on the table cells. Modify the code so the page appears as shown below. You don't need to touch the CSS. The links in the table should point to the following URLs.